Boston College men’s soccer came into the weekend having endured an excruciatingly painful stretch of two weeks of play. The Eagles had lost their last four games, all of which were closely contested, by a combined score of only 7-4, with the loss against then-No. 5 UNC being the only game decided by more than one goal. Interestingly enough, that loss to the Tar Heels would go down as BC’s lone two-plus score regular season defeat. On Friday night, the Eagles battled with Syracuse for 110 minutes before tying the Orange in double overtime, 0-0. With the score deadlocked at zero throughout a full 90 minutes and a pair of extra frames, to say that the match was a defensive standstill would be redundant. While neither side managed to score, both teams had lots of chances and took a handful of shots. It didn’t matter, though—the defenses were up to the task. The first half was dominated by the No. 20 Orange (7-5-4, 1-4-3 Atlantic Coast), which recorded 13 shots, but Eagles (4-7-4, 2-5-1) goalkeeper Antonio Chavez Borrelli was on his A game. A huge moment came in the 13th minute, when Chavez Borrelli came out of the penalty box to head away a fantastic over-the-top ball from a Syracuse defender. The header only managed to get as far as Syracuse forward Tajon Buchanan, who was standing around midfield. Buchanan tried to lob the ball into the back of the net over Chavez Borrelli, who was sent scrambling back into his own goal, but put a hand up to block the shot just as it was about to cross the line. The ball found itself at the feet of Orange forward Ryan Raposo, who blasted a shot back at the goal, but Chavez Borrelli again showed his athleticism by diving to make the stop. Raposo got the ball back and sent a shot wide of the net to end the sequence with BC lucky to have kept the score tied. The rest of the first half ended uneventfully, with the score tied at zero going into the break. For the most part, Syracuse—which tallied nine shots compared to BC’s four—also controlled the latter portion of play, but the Orange simply couldn’t get the ball past Chavez Borrelli. The second half saw the game get more physical than the first, which set the tone for the two overtime periods as well. BC’s defense and midfield were not afraid to body Syracuse players off the ball and take the consequent fouls. The Eagles totaled 16 infractions on the game, including two yellow cards, whereas Syracuse only logged five fouls. The pace and craftiness of the Orange forwards were no match for BC’s physicality, and this was a big reason why the Eagles kept a clean sheet. There were no plays of extreme importance in the second half, despite Syracuse’s shot volume, and overtime started with the game still scoreless. The biggest chance in overtime came off a Syracuse corner, when the ball was launched toward the front post and BC forward Simon Enstrom tried to clear it, but his attempt ricocheted off his head in the direction of his own goal. Fortunately for the Eagles, a defender was stationed at the back post and headed it out of danger. BC created a legitimate scoring chance when junior Trevor Davock made a sublime cut in on his favored right foot, but the forward’s shot ended up in the arms of Syracuse goalkeeper Hendrik Hilpert, and the game concluded in a scoreless draw. BC must now wait to find out what seed it will receive in the ACC Tournament, which will be determined by the outcome of the two remaining conference matches taking place on Saturday night: Clemson versus North Carolina State and Notre Dame versus Pittsburgh. Sitting in ninth place following their draw with the Orange, the Eagles could only be displaced in the standings if the Panthers were to beat Notre Dame. BC would move down to the 10 seed with Pittsburgh replacing them at nine. If the Eagles retain the nine seed they will likely travel to N.C. State, but if they drop to the 10 seed, their away game will probably be against Notre Dame. 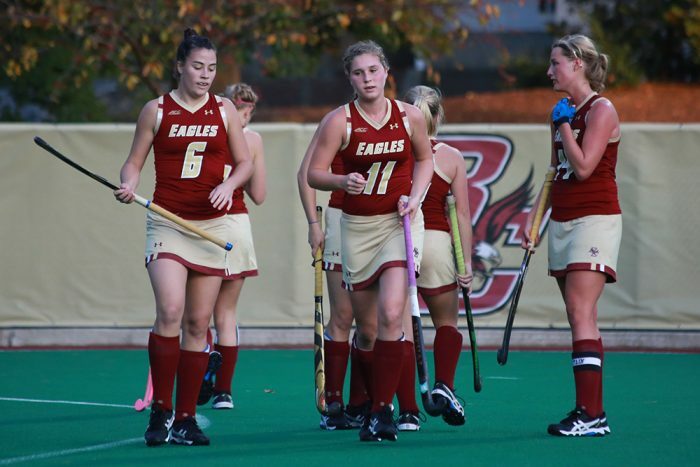 BC hasn’t had much luck all season, dropping six one-goal games. Now the Eagles will need it more than ever to make a postseason push.